Heather Clark (Laura Esping) and Corryn Fell (Aditi Kapil) confront Gidion's Knot. On a sub-textual level, the play sets its course straight into the dark heart of grief, guilt and loss. As directed by Noël Raymond, this production navigates both of these story lines with precision and timing. With an ebb and flow of intensity and acrimony, the dialogue is performed with a clear grasp of the many nuances of the material as it was written. I haven’t seen any of the other presentations of Gidion’s Knot that are being staged nationally, nor have I read the play itself, but I found the blocking of Corryn and Laura’s dance around the small classroom perfectly composed. Particularly in the first act when the audience is essentially looking over Corryn’s shoulder as if in a film, when she gets to the first of many verbal body blows. There are many other manipulations, moments in the story where sympathy is pulled from parent to teacher, but this was the most striking. Walking into the intimate space of the Pillsbury House Theatre, I was struck by how well designed and built the classroom space was. I am used to more minimalist sets in smaller scale theater spaces, and to see the level of detail in the set designed by Joseph Stanley was a welcome surprise. Not better or worse, but a smart choice for this material. This setting grounded material that might have rung false in a sparser environment. The schoolroom props designed by Kellie Larson worked as well—in particular the moving clock and “History” scrawled across a textbook. Clare Brauch, Costume Designer, created a bright look for Heather Clark that highlighted both her career and her strange sort of naiveté. Corryn’s brown and grey look worked for her character, but I would have preferred something less monochrome and ambiguous. Something to suggest more of the dimensionality of the character, her dilemma, and the performance by Kapil. During a few of the breathing points during the no-intermission show, I found myself wondering if the scaling of the entire show was a bit off. To be sure, this intimate story benefits from a theater where the audience is within speaking distance of the show. The small space highlights the strangely deepening confines of the small room Corryn and Heather share, or fight for control of. However, at the loudest and most furious points, the show exceeded the space and drifted toward deafening, both physically and emotionally. Writers often remind each other that “if it’s not on the page, it’s not on the stage,” and I think this covers what may be the weakest part of Gidion’s Knot. The source material is very strong through the first and second acts, as it presents, in fragments, the core tragedy that propels the whole thing. The turns that present these details are the key points of the script and the most exciting for the audience, but the whole structure is a bit artificial and felt to me like the author was withholding too much from the audience in order to enhance suspense. Good suspense is about being aware what you know and what you or the characters don’t know. Creating suspense with limited information is something else. Gidion’s Knot is a play on the legend of the Gordion Knot, an impossible puzzle that Alexander the Great solved by slicing open in a rage of frustration. If we are to take this as the metaphor for the entire show, it presents problems for the material. Are we supposed to believe that Corryn is “solving” the problem by her understandable, but slightly crazy confrontation? Or is it that Gidion, in his own violent frustration, created an existential solution to his own seemingly impossible situation? Why, despite the program, is it assumed the audience would know the connection between the two knots? The result of this and other confusion is that as the play winds its way down through several false endings, I was left with a sense of something not quite done. I love ambiguity and uncertainty in endings, but that needs to feel inevitable. As Gidion’s Knot goes, events are left mostly untangled and exhausted. 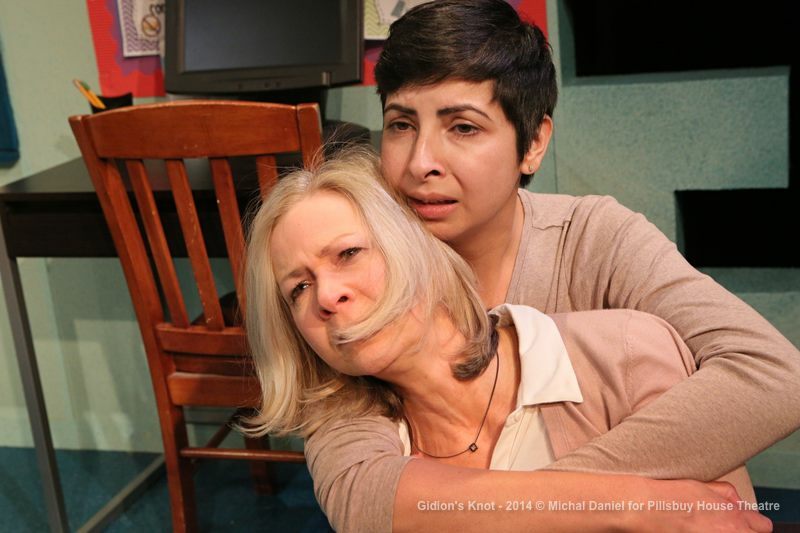 In some ways, the play feels like it ended because the two women drove each other to the brink and there was nothing left to grapple with. The final moments of the play bring us to another point of false suspense, a moment that is supposed to be resonant with implications but feels slight in comparison to the storm that preceded it. This moment felt off, like a triangle note when the entire music built to a crash of cymbals. Gidion’s Knot is not an easy play to watch; it is something to be digested and considered and may leave many audiences unsettled. I have to laud Pillsbury and Raymond for bringing a show with many difficult questions to local audiences, and likewise I enjoyed the consideration and depth of Adams’ script. As it stands, we can admire this knot for all of its intricate work: the layers of the tangle, the Necker-like design of one rope under the other, and the comfort of knowing it is unsolvable. That is what we are left with, because for all of the attention to the structure of the problem, there is neither a practical or violent solution that emerges from the text. The knot remains firmly tied. Asian Pacific Caucus to form in Minnesota Legislature As of 2019, there will be four more Asian American state senators and representatives in the Minnesota Legislature, bringing the total to six. They believe that there is a critical mass and that it's important to caucus on issues relevant to the AP community in Minnesota.